Which brand pairings are making the biggest splash? From the hype surrounding H&M’s collaborations with Erdem and Moschino to queues of shoppers eager to snap up pieces by Uniqlo X Alexander Wang, it’s long been apparent that the Fash Pack go wild for a collaboration – and who can blame them? We can generally assume that two teams’ worth of brains will bear more creative fruit than one, and a meeting of minds, hearts and resources often produces some of the best and most richly nuanced fashion out there. But when it comes to the world of sustainable fashion – a sector which necessitates a truly imaginative, up-to-the-minute grasp of the best eco-sound materials and technologies – which brand pairings are making the biggest splash? Read on for our pick of the best ethical fashion collaborations of Spring-Summer 19. Minimalist athleisure brand Aeance teams up with acclaimed industrial designer Konstantin Grcic for its third men’s and women’s collection. The range moves away from the brand’s sportswear aesthetic and into the realms of tailoring, with sleek longline coats, slim-fit trousers and fitted blazers in a palette of black, slate grey and inky blues, broken with flashes of red and pink. Grcic applies the principles of industrial design to fashion, creating pieces which are “simplified to their fundamental proportions”. Impressively, the range is composed almost entirely of technically innovative and sustainable fabrics, with 96% of its textiles being recycled, purely natural, biodegradable or bio-based. The latest project to come out of Adidas’ collaboration with ocean conservation initiative Parley, these chunky Solecourt Base Parley Shoes in white and vapour blue are designed for the tennis court with their high durability outsole and abrasion-resistant toe wraps, but stands up equally well as a sports-centric alternative to the ugly-pretty ‘retirement trainer’ look popularised by the likes of Balenciaga. The yarn features Parley Ocean Plastic™, which is made from recycled waste gathered from beaches and coastal communities before it reaches the ocean. 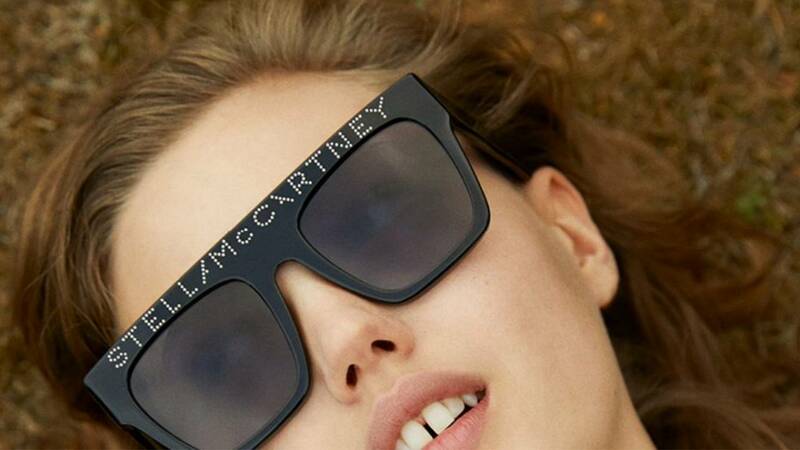 Long-term ethical fashion advocate Stella McCartney partners with Kering Eyewear for a sustainable eyewear collection, which borrows from the retro aesthetic of the 1970s and 80s. Crafted from environmentally friendly bio-acetates – a material made using fibres from wood pulp, making them entirely biodegradable and phthalate free – the collection is characterised by its oversized frames and cat-eye lenses. Modern and ultra-feminine, the eyewear range feels like a natural progression from the brand’s ready-to-wear collections and builds cohesively on its sustainable philosophy, drawing on extensive research into premium naturally-derived materials. A duo of ethical fashion brands, Haitian-Italian designer Stella Jean (best known for her bold prints and multicultural aesthetic) and Italian womenswear brand Pinko, are the brains behind this capsule collection of 5 t-shirts. In 2018, Pinko launched Treedom, a project which will see 10,000 fruit trees planted in Kenya. Christened the PINKO forest, the initiative will feed and support the local community with its mix of mango, banana, African cherry, avocado and macadamia nut trees. The t-shirts, made from organic cotton and splashed with colourful watercolour motifs and embroidery, take inspiration from the Masaii culture of Kenya and are intended to spread the message of the #StellaJeanPINKOtreedom campaign. The collection will be available to buy from April. Ethical fashion stalwart People Tree has teamed up with London’s leading art and design institution the Victoria and Albert Museum for a playful, modern spring-summer 19 capsule collection celebrating the beauty and variety of pattern which the London museum is renowned for. Made from sustainable fabric 100% TENCEL™ Lyocell and organic certified cotton, the collection gives fresh life to patterns cherry-picked from the museum’s archive, including lavish berry-toned floral prints and 1930s Calico prints.